Every year without fail, I pore through the online recipes, hoping to find a new red, white, & blue dessert. One that will be delicious. One that will be beautiful. One that will be perfect for fourth of July! Every year I look...and every year I'm faced with the same old things: tarts, gelatins, frostings, and sprinkles. Well, this year I decided enough was enough! If I couldn't find the perfect recipe, I'd just have to make one. Here I present to you my torte. 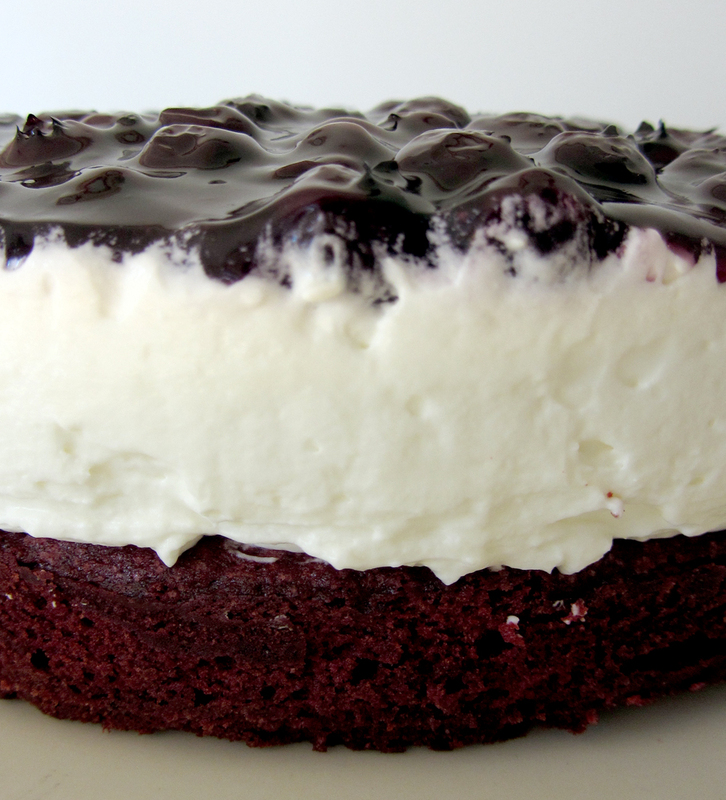 The red is a velvet brownie base (inspired by Baked Perfection). The white is a light and fluffy cream cheese. 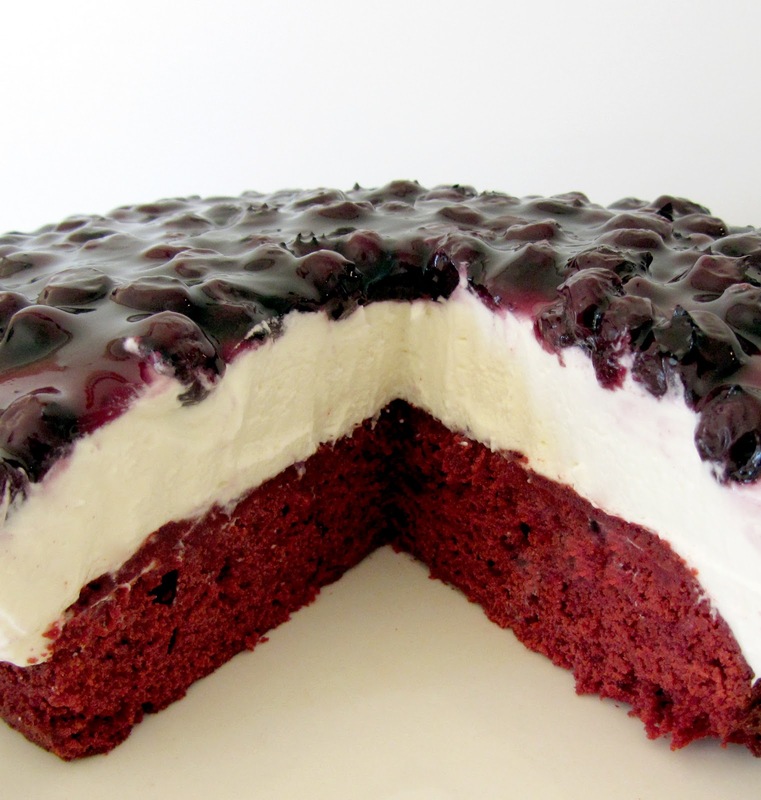 And the blue is a layer of sweet summery blueberries. Enjoy your summer, enjoy your independence, and enjoy your dessert! 1. Preheat the oven to 350°. Grease the bottom of an 8” springform pan. Line the pan bottom with a parchment or waxed paper circle. Grease the paper circle. 2. For the brownie base: In a medium bowl, whisk together the flour and buttermilk powder. Set aside. 3. Add the butter and sugar to the bowl of a stand mixer. Beat until smooth and fluffy. 4. Sift the cocoa powder into the bowl with the butter mixture. Beat until well blended. 5. Beat in the eggs, one at a time, until combined. Beat in the food coloring, vanilla extract, and vinegar. 6. Add the flour mixture to the bowl. Beat on low speed until the dry ingredients are just incorporated. 7. Pour the batter into the prepared pan. Smooth the top. Bake for 25-30 minutes or until a toothpick inserted into the center comes out with a few crumbs attached. 8. Place the pan on a rack to cool completely. Cover and chill while you make the next layer. 9. For the cream cheese layer: place the cream cheese in the bowl of a standing mixer. Beat until smooth. Add the powdered sugar. Beat until smooth. 10. Add the cream to the cream cheese mixture. Whip until still peaks form. 11. Pour the mixture evenly over the brownie base. Smooth the top. Cover and chill 15 minutes. 12. Gently spoon the blueberry filling over the top of the cream cheese layer. Use an offset spatula to spread evenly. Cover and chill for at least an hour to set. 13. Push an offset spatula straight down the side of the pan to the bottom. Run the spatula around the edge of the pan to loosen the torte. Open the pan and remove the spatula (this will help prevent smearing).